For Ann's birthday party Saturday night, I made Key Lime cupcakes (see last blog post) and S'mores cupcakes. At the party we asked our nephew Ben what the cupcakes looked like. Emily and Matt apparently don't expose him to enough campouts and campfires...because he took one look at the S'mores cupcakes and said they looked like "robots." Then he looked at the Key Lime cupcakes and said they looked like "Rhinos." Not exactly the look I was going for...but ok. 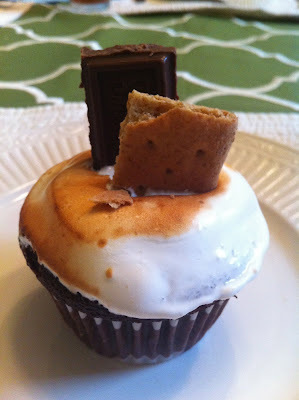 I think they turned out super cute and really did taste like a campfire s'more.